Free, Freemium or Paid? That’s one of the many decisions facing Developers of mobile apps, but recent research may help with the decision making process. Now, new research from analytics firm, Distimo, indicates that this strategy is working, because a whopping 98% of all Google Play Store revenue comes from in-app purchases of free titles. In-app purchases represent 89% revenue in App Store. What about the other 2%? 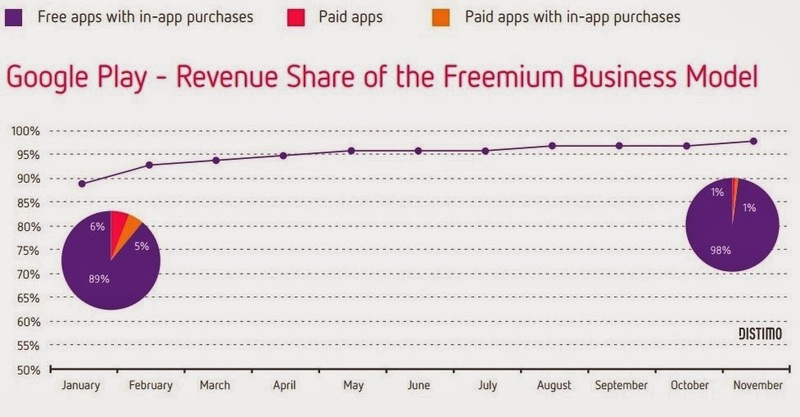 Their research also shows that we’ll spend in-app on games more than any other category, with 90% of the revenue coming from the freemium model. A respectable 8% comes from straight-up paid apps, while 2% comes from the pesky paid-paid variety. One of the biggest selling points of Android over iOS is the fact that there are more free apps available in the Play Store than the App Store. Sure, with free apps there are in-app advertisements and the occasional annoying pop-ups that users need to withstand. However, most people seem willing to deal with it, considering the growing popularity of Android. It’s also worth noting that these figures are worldwide, and the country-by-country breakouts are equally impressive. The huge app revenue growth is coming from Asian emerging markets. South Korea increased its app spending an astounding 759%. China and Japan grew by 280% and 245% respectively. This leads to many of the top grossing apps in the report being ones we’ve not heard of stateside, Rounding out the top five growth markets are Russia and Germany, with 125% and 90% bumps. The United States sits in seventh place with 81% growth, lagging France with 89%. The cross-platform bridge is closing as well. Google has climbed from 30% to 37%, leaving Apple with 63% of worldwide app spending. That change occurred between June and November of 2013, when the two studies were done. Of course, when considering scale, those numbers don’t affect Apple or Google negatively, regardless of spread. If you’re wondering what the Play Store makes in a day, Distimo estimates Google makes about $12 million a day from the Play Store, a huge bump up from $3.5 million a day from a year ago. For comparison, Apple makes $18 million a day now, compared to its $12 million a day last year.